You may have noticed that Speaking of Research has expanded its list of national animal research statistics to around 30 countries. We would like to thank the RSPCA’s Lab Animal team for supplying us with some of our more recent EU additions. 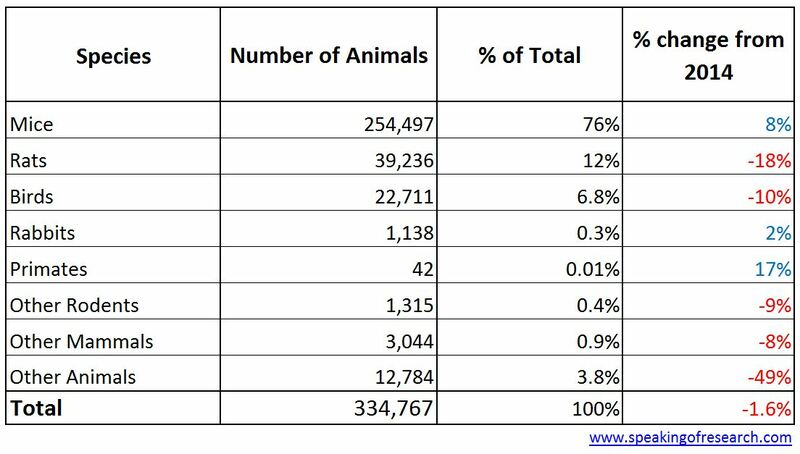 However, our most recent addition is the 2015 statistics for Israel, which showed that the number of animals used in research had declined by 1.6% to 334,767 animals. These numbers can be found on the Israeli Ministry of Health website. The number of most species declined, except for the use of mice, rabbits and primates. The main fall (49%) was in “Other Animals”, which includes fish, amphibians and reptiles. A 20% fall in the number of rats used, down to under 40,000, also contributed to the overall slight fall in numbers of animals used in research. 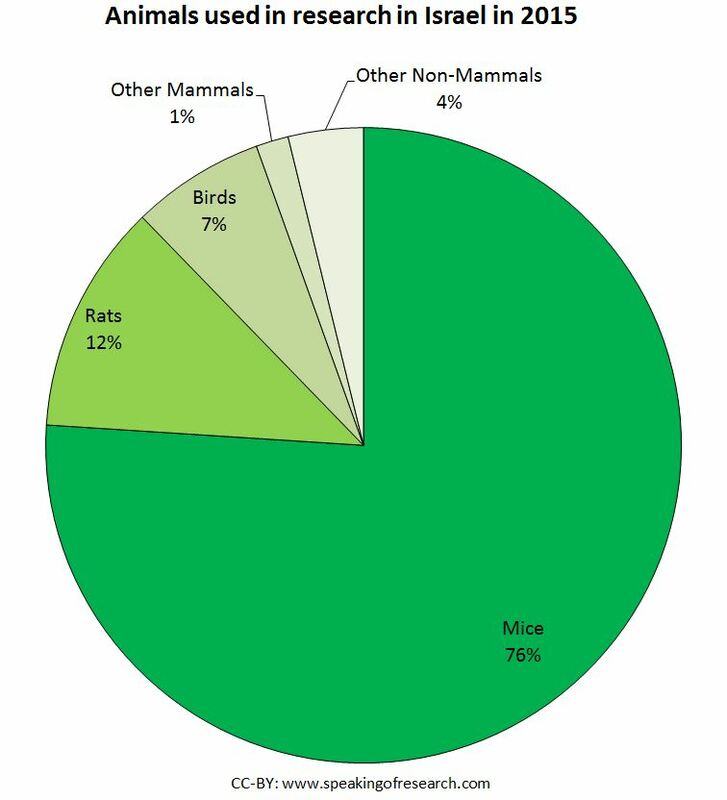 Mice are far and away the most commonly used animal in research in Israel (at 76%). Rats, Mice and Birds accounted for around 95% of animals used in research. The 42 primates used accounted for 0.01% of research animals in 2015. Research on animals, particularly primates, has been under pressure in Israel for the past few years. This led to seven Nobel Prize Laureates and the presidents of seven major research universities writing to the Prime Minister, and warning him of the risks to Israeli research posed by the animal rights community there. 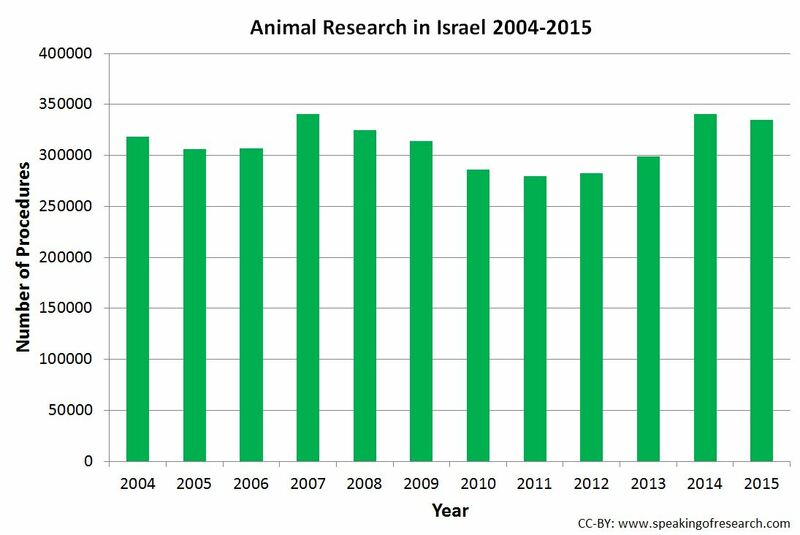 Trends in Israeli animal experiments 2004-15. Click to Enlarge. Historical statistics show that the number of animals used each year has been fairly constant over the past 11 years – fluctuating between around 275,000 and 340,000. The slight variations may account for individual projects which used a lot of animals, or from slight changes in science funding over the years. The article also provided information on animal suffering, similar to what is included in standard European statistics. The research procedures were categorized according to a five-level scale determined by the NCAE, which considers the animals’ suffering. According to this scale, 9% of the studies were at the lowest level, 19% were at the second, 30% at the third, 29% at the fourth, and 13% were at the highest level. We will be keeping an eye on future statistics. Posted on July 8, 2016 July 8, 2016 by EditorPosted in News, StatisticsTagged Animal research statistics, israel, Israel animal research, Statistics.